This fresh, lively starter is easier than it looks to prepare and is always popular at Roux at the Landau. The peaty smoky notes of the whisky highlight those in the salmon and the freshness of the apple balances the richness of the salmon. Don’t be put off– the salmon is not raw, the salting and smoking process has already ‘cooked’ it. 1. To make the whisky dressing put everything into a liquidizer (or a tall beaker if using a hand blender). With the engine running on high speed add the oil starting at a slow trickle and gradually increasing the pace. The dressing should be the consistency of single cream and be tart, full of flavour and pack a good alcoholic punch. 2. Peel the kohlrabi and cut into – approximately – 3/4 cm cubes. In a small bowl season the kohlrabi with a splash of cider vinegar and a little sea salt and leave it to macerate. 3. With a thin-bladed sharp knife remove the skin (if attached) and any brown meat from the smoked salmon. With a long swooping motion cut the salmon into slices about ¾ cm thick. Cut these slices lengthways into long strips the same thickness. Next cut across the strips, a few at a time, to make little salmon dice – don’t worry – they don’t need to be perfect. If your salmon came pre-sliced roughly chop it into approximate dice. Cover the salmon in a large bowl and keep cold. 4. When ready to finish the dish cut the apple into a few different interesting shapes – matchsticks, dice, thin slices or little balls. 5. Add the kohlrabi, chives and a few generous tablespoons of the whisky dressing to the salmon and fold together gently. 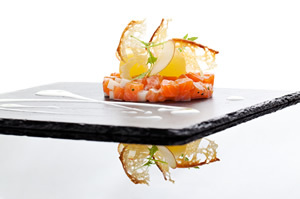 The tartare should not need any additional salt as the salmon is well cured, but always taste and check regardless. 6. Serve the tartare to share with the apples and a few young salad leaves on top, plenty of croutons and the extra dressing on the side. For a more formal presentation spoon the tartare into moulds on small plates, arrange the apple, leaves and a few croutons on top and finish with a little more dressing around.